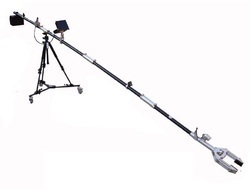 Leading Manufacturer of telescopic manipulator from Delhi. Telescopic Manipulator provides an improved ability for Bomb Disposal Technicians and EOD /IEDD operators to maximize their standoff distance when working in close proximity to a suspect package or Improvised Explosive Device (IED). It is comprised of the mechanical claw. The controller can control the movement of the claw. It can control the claw’s open and close and achieve the mechanical claw’s exact operation with the LED Screen.